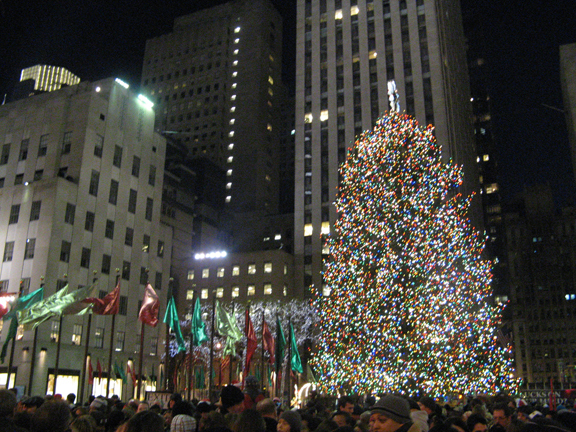 The Rockefeller Center Christmas Tree is makes the season bright! 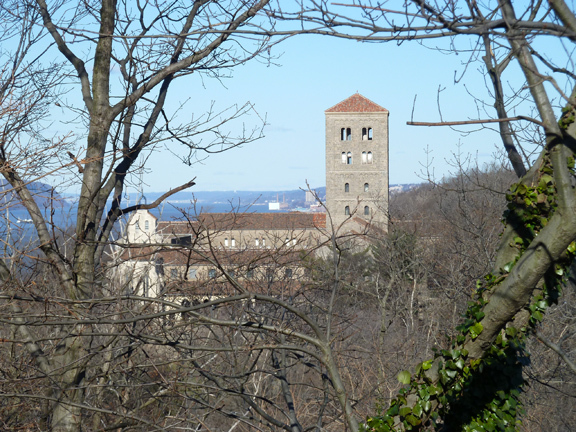 The Cloisters is seen from within Fort Tryon Park. The courtyard at The Frick Collection. 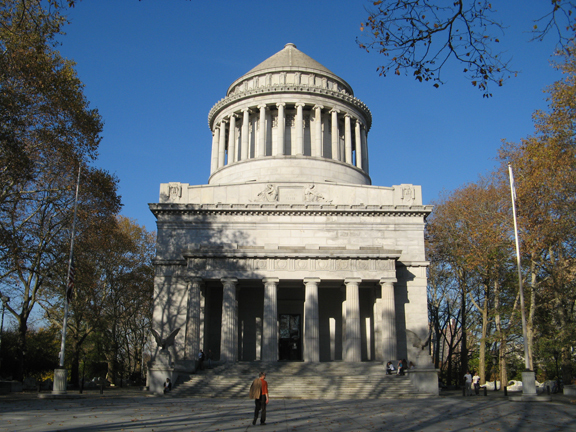 One of the sights in Riverside Park is Grant’s Tomb. 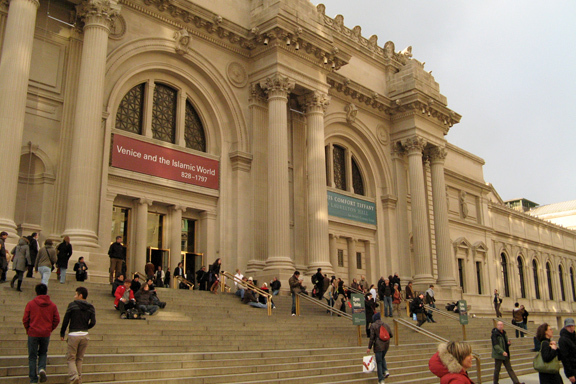 The steps leading to the Metropolitan Museum of Art are a popular gathering spot. 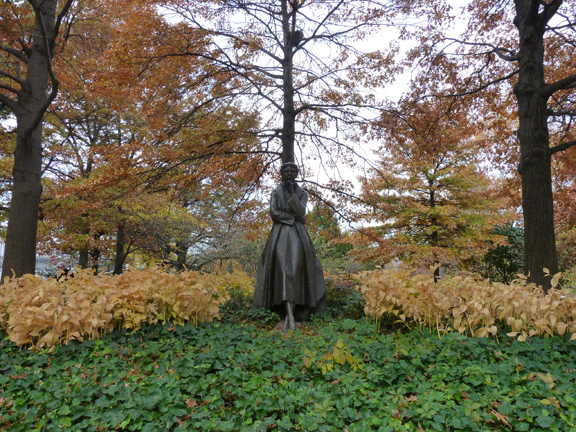 This bronze memorial to Eleanor Roosevelt stands at the start of Riverside Park. 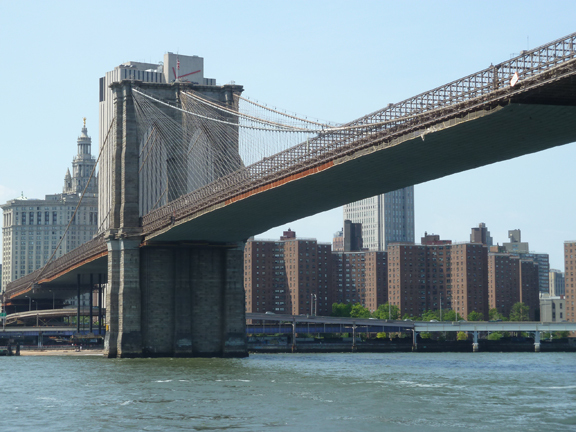 The 1883 Brooklyn Bridge leads from Lower Manhattan to Brooklyn Heights. 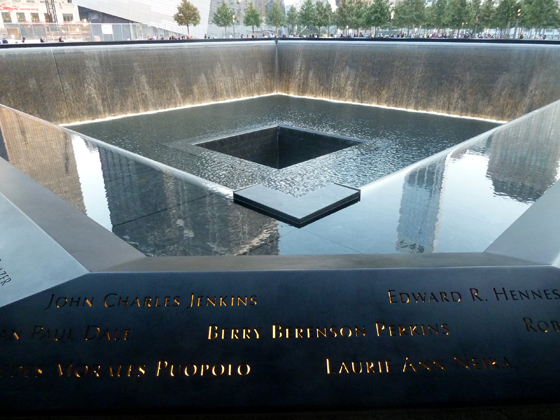 The North Pool of the 9|11 Memorial. What are your ideas for a Specialty Tour in New York? Do you have a sight in the city that you have always wanted to see, but just did not know how to go about it? Have you visited New York many times, but now are you looking for a unique experience? Based on your ideas, Walk About New York can design a Specialty Tour for you, your friends and family, or your group. What shall it be? Please allow me to make some suggestions; refer to the photographs to see what you might get to see. Festively decorated windows at the city’s leading department stores, the Rockefeller Center Tree, and other seasonal sights are a December must. Christmas in New York is special! 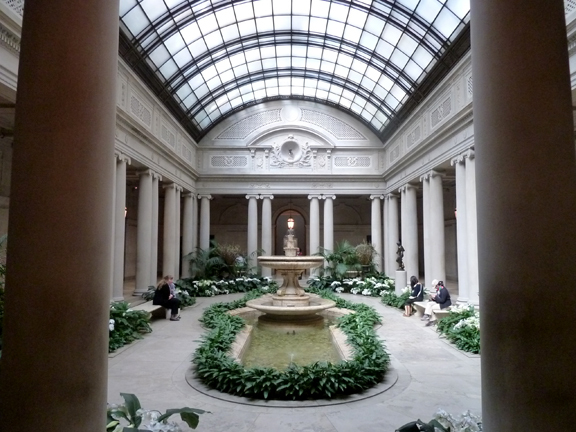 The Frick Collection, on Fifth Avenue, The Cloisters, in Inwood’s Fort Tryon Park, and the Hispanic Society in Washington Heights are three small but brilliant museum gems that I recommend. A on private tour of the the Metropolitan Museum of Art you can see its highlights in an efficient, enjoyable way. The Museum is open until 9 PM on Friday and Saturday, making that a perfect time for a visit with fewer museum visitors. Riverside Park, along the Hudson River offers spectacular views of the George Washington Bridge. Its sights include Grant’s Tomb and fabulous Art Deco-styled apartment buildings. Although a sad chapter in New York City’s history, the 9|11 Memorial and Museum are well worth a visit. The Memorial is peaceful; the Museum is educational. Walking across the Brooklyn Bridge and strolling through Brooklyn Heights are fun ways to spend an afternoon. The views of Manhattan from the Brooklyn Heights Promenade are stunning; and the sight of the East River from the bridge is breathtaking. Maybe ride a ferry back to Manhattan. 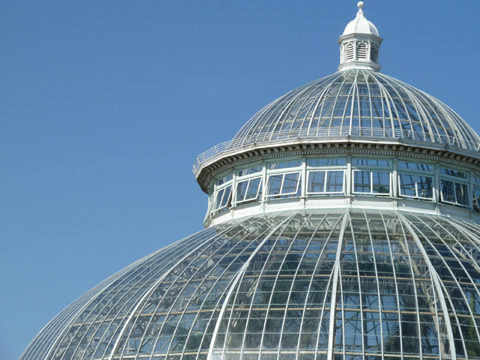 The New York Botanical Garden in the Bronx is fun to visit any time of year. The Garden’s Enid A. Haupt Conservatory always has a great exhibit on display, such as orchids in the spring. Consider the Gay Graves Tour at Green-Wood Cemetery, a National Historic Landmark in Brooklyn. It is a special place filled with natural and artist beauty. Plus there are outstanding views of Manhattan from Brooklyn’s highest point! Please contact me to discuss what you would like to include in a tour that will be yours alone. Through e-mail exchanges and phone conversations we can work out the dates, the time and the pricing for your Specialty Tour of the City That Never Sleeps! All Tour participants assume normal liability for their behavior during the Tour.